A Barlow Lens is an optical device that allows you to multiply the apparent magnification of your telescope with the eyepieces you already have. They come in a variety of powers from 1.4x to 5x and in both 1.25″ and 2″ sizes. The advantage to using one of these is it can greatly increase the number of different magnifications you have available. For example: if you have a 25mm and 10mm eyepiece, buying a 2x barlow will give you the equivalent of a 25mm, 12.5mm, 10mm and 5mm eyepieces. Can also fail to focus the light correctly near the edges. As a general rule the more you spend on the barlow, the less image degradation you get, to a point. That does not mean that the average amateur astronomer has to spend a fortune, getting into barlows can be very economical to start with. Many people find the less expensive barlow lens to be just fine for their visual use whereas astrophotographers tend to go for the higher end devices. Also note that the more powerful the device you use, the more likely you are to see image degradation, this is why most people stick with the 2x barlow lens. A larger blurry blob is not nearly as nice to look at as a smaller sharp image of Saturn! The highest quality barlows available is actually called a Powermate and is made by Televue. The Powermate is basically a very high quality barlow with a second set of lenses inside that do additional correction to make the image as perfect as possible. These tend to solve all four issues with the degradation of the image listed above however not even the Powermates are perfect. The most popular of the Powermates are the Televue 2.5x Powermate 1.25″ for about $218 and the Televue 2x Powermate 2″ with 1.25″ adapter for around $327. When I tell people the price of the Powermate the first thing they do is gasp. Yes, they are expensive. The image quality however, is amazing. Remember that these will basically double the number of eyepieces you have. If you have a telescope with a 2″ focuser get the 2″ version of the Powermate so it will work with all the eyepieces (and cameras later down the road!) you have or will ever purchase. If you just can not see yourself paying over $200 for a barlow (which really is cheap for what it does) then there are certainly good alternatives. The best of those is a barlow lens made by Televue, the same people we just talked about. While these lack the secondary correction lens found in the Powermate, they still have the outstanding quality primary negative lens assembly and fantastic build quality. 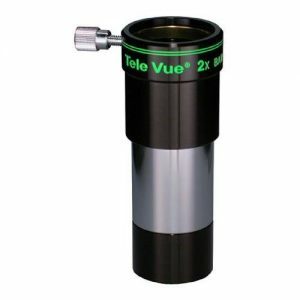 Televue makes two standard 2x barlow lens products, the Televue 2x Big Barlow 2″ for around $218, and the smaller Televue 2x Barlow 1.25″ for around $128. Again I would recommend you get the 2″ version if you have a 2″ focuser and the 1.25″ version if you do not. 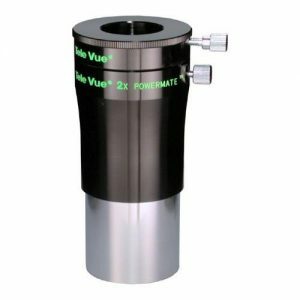 Sure, the 1.25″ version will work in a 2″ focuser if you only have 1.25″ eyepieces but this stops you from using 2″ eyepieces in the future or from using some camera adapters. Astromania is one of my favorite “off brand” brands. By that I mean they are not one of the big boys in any category but they still make excellent quality equipment for the money. This includes their barlow lens selection. Their 2″ ED 2x Telescope Barlow lens is an excellent device which includes enhanced dispersion glass to reduce aberrations and provide a high quality image and runs about $58. 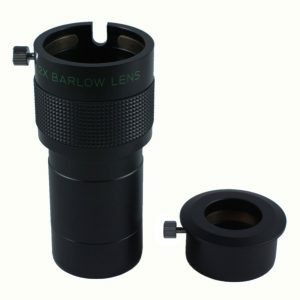 This barlow includes a 1.25″ adapter making it perfect for your 2″ focuser allowing the use of both 2″ and 1.25″ eyepieces. Now let’s say you only have a telescope with a 1.25″ focuser, or only have 1.25″ eyepieces and have no plans to upgrade to 2″ in the future, but you still want a pretty nice sub $100 barlow…. 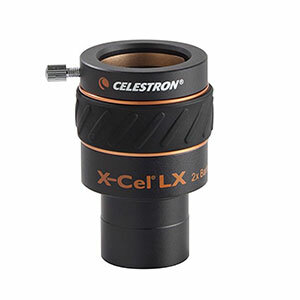 My favorite 1.25″ midrange barlow lens is the Celestron 93529 X-Cel LX 1.25″ 2x Barlow for around $65. These barlows, and the matching eyepieces, are my favorite in this price range and I have a full set in my eyepiece case. They are fully multi coated providing great views, well built to last a long time, and have an awesome rubber grip ring around the outside. 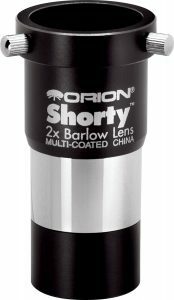 The most popular inexpensive 2x barlow lens out there is the Orion 08711 Shorty 1.25″ 2x Barlow Lens for around $48. It is in almost every beginner’s kit I see, and many more advanced kits as well. It is a solid multi coated performer without any frills. It gets it’s “shorty” name from the fact that it is extremely compact and sticks out of the focuser far less than many other barlows. 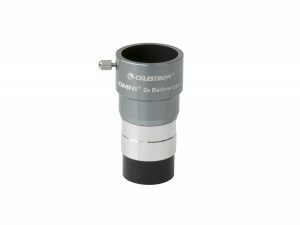 The next most popular is the Celestron Omni 2x Barlow Lens for around $34. In it’s price range it is an excellent performer and should last you many years of service until you decide to upgrade to a higher end barlow lens, or get 2″ eyepieces and have no choice but to replace it. So now there will be a ton of people screaming that they can get a barlow online for less than $20, and that is absolutely true. Take a very close look at those before you purchase them. A great example is the SVBONY 1.25″ 2x Barlow Lens which currently is listed as “Amazon’s Choice” for “barlow lens” and has 4.4 stars with 155 customer reviews. Looking closer you can check it out on www.fakespot.com to find out that the company and product only gets a review grade of B with 80% non-fake reviews. Compare that to the Orion Shorty which gets an A, as does the Celestron Omni. I am also a little concerned by the fact that the item seems to have changed names as the the fakespot.com report shows the manufacturer as VITE while Amazon shows SVBONY. Then there is the chart that shows that for a product that has been on Amazon for around two years, almost two thirds of its reviews all happened in one month of 2018?